Here is an easy FREEBIE! 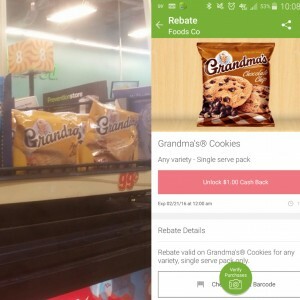 Submit for $1 Cash Back for Grandma’s Cookies from Ibotta! I bought these at Foods Co, but the offer is good ta Safeway, Target, Raley’s. Coupons for Doritos-Deals at Target and Safeway! Ben & Jerry Slices are $1.75 After Ibotta Cash Back! Save 50% at Safeway! FREE Quarter Pounders for 1 Year at McDonalds? Here is How.